We have started our mission to give you the Ultimate landing page builder with zero complexity. Therefore with lots of dedicated research and hard work, we have developed WPOnepager. We are continuously putting our effort to make it even better and easier for you. With every update, we are trying to make WPOnepager more block rich, layout rich and easy. In today’s update, we have brought something special. In WPOnepager 2.1, we have brought new dashboard, new blocks, new template and some improvements along with fixes. Let’s check the details from below. With new version here is the new dashboard. It comes with a fresh and simple look that lets you create your required landing page within one click. With WPOnepager 2.1, page creation overflow is changed. In this version, you can directly create a landing page by importing a template. Just go to the dashboard, select the template and create by giving a title to it. That’s all, your page is created now just change the content and images. We kept it absolutely simple so that you go through no complexity. A brand new feature block comes with WPOnepager 2.1. This block lets you show your features, from 2 columns to 4 columns. You can put the important features of your site, shop, service with this feature block. This block comes with pre-configured settings, but if you want to customize yourself then you can do it from the settings tab. Some of the must-have settings like columns, title size, description size, etc, is included with this block. A brand new complete app landing page is released with WPOnepager 2.1. From top to bottom every section of this page is kept simply gorgeous. The designer blended art with need then created this landing page. Present your app in a unique way with this landing page. To take the attention of your client, lucrative animations are used on this page. 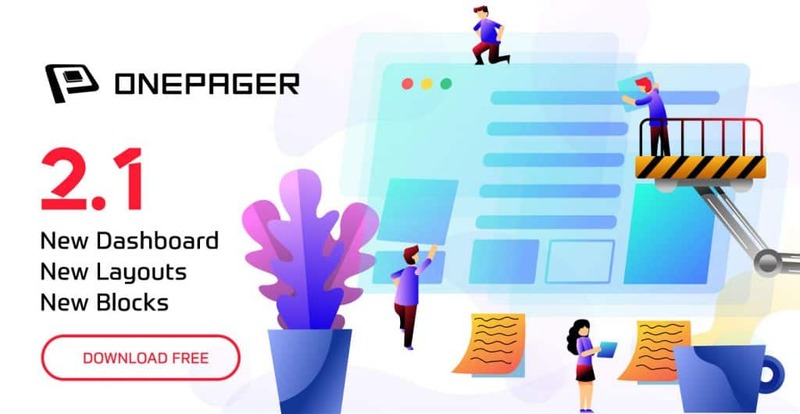 No matter how your app is, you will be always able to describe your app properly with this app landing page of WPOnepager. Now you can use the header and footer that is provided by your theme. In the previous version, you had to only use the header/footer that is provided by WPOnepager, you were limited. But now you are free to use your preferred header footer. Open the page and go to page attributes > template. In this way, you can use any header footer you want. Sell your digital product and goodies with WPOnepager. WPOnepager now fully support WooCommerce. Just install & configure the WooCommerce and then insert the block that lets you showcase your WooCommerce product. Now just change the contents along with images and you are ready to go. In future update, we are releasing more blocks that will support WooCommerce. Some of our clients reported that they get confused with new sections name as the default name is ‘Untitled Section’. Therefore we have decided to show the name of every section. There will be no more confusions regarding this problem. For your ease of access, we have added ‘Onepager’ label with every page that is created with WPOnepager. You will be able to easily distinguish which page is built with WPOnepager and which is not. Moreover, we have also added ‘Edit with Onepager’ button with all pages, so that you can edit with a single click. Animations always add an additional attraction to your section. Therefore we have put marvelous animations with every block of WPOnepager. Don’t worry it won’t slow down your website, use without any worries. Hope you will like the new version. There are more awesome things are coming in the later version, stay tuned. If you face any problem, let us know.